Alex Garland, the British writer/director, most famous for writing the Danny Boyle films The Beach (2000) and Sunshine (2007) has announced plans he intends to adapt the science fiction Jeff Vandermeer novel ‘Annihilation’. Written in 2014, the book is the first of a trilogy which follows a team of scientists who set out on an expedition to explore Area X, an area cut off from civilisation. This team are the 12th expedition to venture into Area X, the previous 11 teams all either disappeared, died or returned with various afflictions. This will be a return for Garland to science fiction, but he’s not taking Danny Boyle with him this time. Alex Garland first came to fame when in 2000 Danny Boyle adapted his novel The Beach, starring Leonardo DiCaprio. But despite the popularity and success of the source material, the film failed to live up to expectation. What was more troubling than the box office and critical flop of The Beach was the actual making of the film. Ewan McGregor, who previously starred in both of Danny Boyle’s first feature films Trainspotting and Shallow Grave was initially chosen for the lead role of Richard, but the studio insisted on Leonardo DiCaprio, and cast him before Boyle could intervene. This angered McGregor so much that he supposedly hasn’t spoken to Boyle since. The shooting locations of the film angered environmentalist groups as it was revealed that the beach chosen was heavily altered to fit the look of the film. This included planting of non-native trees, clearing huge parts of land, subsequently affecting the eco-system of the island, as clearing of huge parts of sand weakened the beaches defence against tidal swells, resulting in destroyed coral reefs. Two years after The Beach was made, Alex Garland and Danny Boyle teamed up yet again for the cult hit 28 Days Later, the post-apocalyptic thriller set in England. Starring Cillian Murphy as lead character Jim, who awakens in a deserted hospital to a wrecked and desolate London, as he tries to find survivors as a mysterious and deadly virus has swept through the entire country. The film went on to gross $82million worldwide having only cost $8million to make. Staying with science fiction, Garland went on to make Sunshine with Danny Boyle in 2007. Again starring Cillian Murphy, who this time plays the role of a scientist, who along with several others, are sent on a dangerous mission to reignite the sun with a nuclear bomb. After making the film, Danny Boyle went on record to say he will never work in a science fiction film again, due to the stressful nature of such a production. Annihilation will be Alex Garland’s second film behind the wheel after his latest directed film Ex Machina came out to critical acclaim. The film centres around the breakthrough of artificial intelligence, where a young programmer has been selected to evaluate the AI of a beautiful female robot. 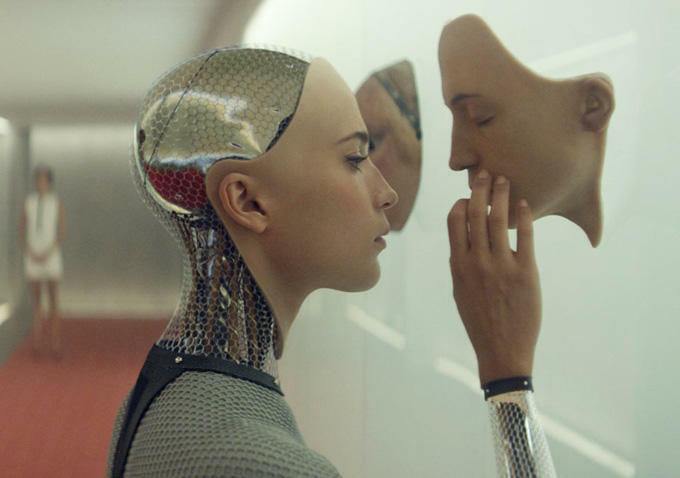 Starring Alicia Vikander and Oscar Isaac, Ex Machina explores the inevitable advancement of artificial intelligence and what moral implications the technology will bring, blurring the lines between man and machine. As far as the cast goes for Annihilation, no details have emerged yet aside from Natalie Portman is in early talks to play the lead scientist in the Paramount Pictures and Garland project. Filming won’t begin anytime before 2016, so there will be plenty of time for actors to inevitably join Garland after the success of Ex Machina. Until a deal can be reached between both Portman and Paramount, no other actor will be signed on, where rumours suggest Tilda Swinton and Julianne Moore have been shortlisted for supporting cast members. With the original book spanning a trilogy, the rights for all three films have been snapped up by Paramount Pictures, in the hope that they may form a film trilogy to accompany the books, which were all released last year. Annihilation begins filming in 2016 with no confirmed release date, Ex Machina was released in April this year.